The Friendship Peak is a majestic mountain located at Pir Panjal range in the Kullu district of Himachal Pradesh. Perching along an altitude of 5,289 m above the sea level, the Friendship Mountain remains snow bound anytime. 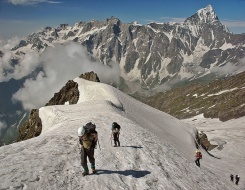 The ideal route to access this peak is through Dhundi and Beas Kund. Normally this is a 13 day trekking expedition that starts from Delhi and ends in Bakarthach. The trekkers then make their start from Manali to Solang to Bakarthach to reach finally at the Friendship Peak. To enjoy the trekking wonders at its most, different camping have been organized at different sections to move forward to another advance base camp. This is an ideal trekking location where no additional technical trekking skills are needed and even the fresher can dare to conquer the peaks. Although the summit ridge requires fixed rope & crampons hence it surely requires a good fitness but it needs no formal training of mountaineering to climb it. This site offers a panoramic view of some snowy peaks namely Friendship. Friendship Pass Trek is a popular trekking spot in Himachal which is a fairly accessible location. The nearest town from Friendship Peak is Manali where the expeditors make their start and the road head is Solang Nala which is the main town in Solang Valley, just 18 kms from Manali. In the morning half day sightseeing at Delhi. Evening drive to Manali by AC Volvo coach at 18:30 hrs. Overnight journey. Early in the morning drive to Solang and from here trek to Bakarthach. Enroute you will trek through lush green valley and thick forest. Dinner and overnight stay at camp. Acclimatization days around Bakarthach. Dinner and overnight stay at camp. In the morning after breakfast trek to base camp of friendship peak. Dinner and overnight stay in camp. In the morning after breakfast trek further and establish Advanced Base Camp. Dinner and overnight stay in camp. In the morning trek back to Solang and from here drive to Manali for overnight stay. In the morning explore the surroundings and by evening drive to Delhi by AC Volvo Coach. Overnight journey.